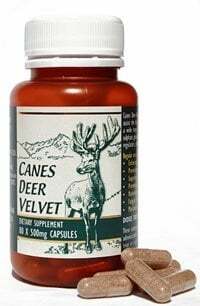 Canes Deer Velvet has proven benefits for athletes! Top New Zealand athletes, including triathlete Hamish Carter have trialled our N.Z. certified Deer Velvet Sports Nutrition Supplements. Athletes tend to expect a lot of their body. They place a great demand on the nutrients involved in maintaining joints and muscles in optimum condition. As we age our bodies produce less of these nutrients naturally and the body may be unable to keep up with demand. Using Canes Deer Velvet can support the body in healing and maintaining the joints to their optimum condition, in turn preventing injuries. Buy Deer Velvet online and help yourself to peak performance today! How Does Deer Velvet Help Sports People? Encourage blood production, including white blood cells to support the immune system and red blood cells to naturally optimise oxygen carrying capacity of blood. Significant for physical energy and mental stamina in athletes wishing to maximise performance. Assist cell function and support the body to regulate inflammation and swelling, and therefore pain. Helpful in minimising recovery times after physical workouts and minimising the effects of sports injuries. (25%) a vital structural protein found in cartilage, providing it with elasticity and shock absorbing properties, and a strong framework to hold the other cells. These building blocks of protein are necessary for muscle action and recovery. They are involved in growth and repair of tissue, replacing muscle stores and providing energy. Deer Velvet contains 47% protein and includes over 30 Amino Acids including 9 out of the 10 essential Amino Acids that cannot be synthesised by the body and must be taken in by diet. These 9 Essential Amino Acids are Arginine, Histidine, Iso Leucine, Leucine, Lysine, Metionine, Phenylalanine, Threonine, and Valine. This includes Lecithin known to be involved in breakdown of cholesterol, Linolenic acid, Sphygnomyelins, Gangliosides, Omega 3 and Omega 6. These give the body the right raw materials to maintain optimum hormone balance. Help yourself to healthy joints today! Check out this months specials!